For our April meeting, we welcome back Tom Bullock of Shreveport. 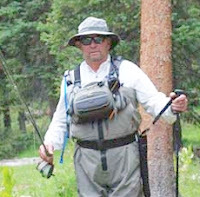 Tom is an avid trout angler, and along with his friends Davy Wotton and Dave Whitlock, has popularized various nymphing techniques on Arkansas rivers. His presentation will be "Fishing the White & Norfork Rivers Below the Dams". The program will address a short history of the rivers before and after the dams, how the tailwater results in rapid growth of trout, the skills needed to catch very big fish, including equipment and flies, identifying habitat, methods of fishing, how to release fish safely, rising water safety, and a short discussion on river maps and places to fish. If you've never fished the White & Norfork rivers in Arkansas, this is a MUST session. Even if you've fished many times, Tom's expert advise will make you a better trout angler. Because of the special presentation, we'll keep the business session to a maximum of five (5) minutes. 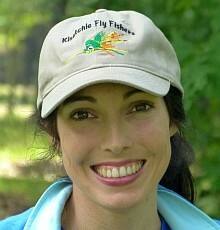 We'll talk about the upcoming North Lousiana Fly Fishers Masters Series in July (which Tom organizes and can address) as well as the Summer Workshop in June. Our "Mixed Bag" Contest is a members-only CPR online tournament where size doesn't matter, but variety of species does. The contest started March 1st and so far, it's been a tough few weeks. Here in the Cenla area, we've had 180 percent of average rainfall to date! And near record low temperatures on several nights. Between the heavy rain and the cold, there's been gusty winds. Even the commie tackle folks are struggling to catch any decent numbers of fish. We're hoping the weather improves soon so members can have fun and put a lot of fish on the board. Mike Carlin, Barbara Carlin, Tom Zabasky, Carlton Townsend, Jim Johnson, and Gene Taylor each have 1 species. Several interesting entries so far. 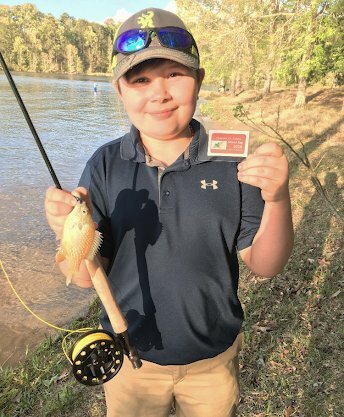 Young Spencer Hackney's longear on his first cast as a flyrodder (wow! ), the yellow bass taken by Catch Cormier off the bank in downtown Natchitoches, and the four fish taken by Bill Morrison on the infamous "Mop Fly". Yes, the Mop Fly does work. So does the Sqwirmy - at least Carlton tells us so, lol. Another interesting catch was Greg Babin's longear taken on the "Indicator Fly" that the club tied at our March tying session. This month, Catch Cormier will lead us in tying the Ruffled Birds Nest, a variation of the Birds Nest fly. The Birds Nest nymph was created in 1959 by Cal Bird, the owner of a small fly shop in San Francisco. His original pattern used wood duck flank feathers and a dubbing body. The Ruffled version uses various feathers from a pheasant skin, with a beadhead for weight. This verson gives a fuzzier appearance that attracts trout and sunfish. 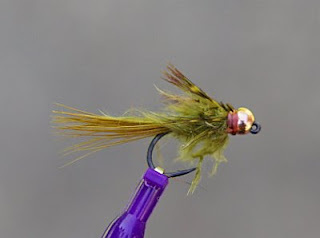 It's also easy to tie - so the many new tiers in our club will like this fly! As always, bring your tools if you have some. If not, we have a few sets for use during the session. Materials will be provided. Beginners and guests are welcome!